Here’s a great way to transform uninterested readers into enthusiastic book lovers! 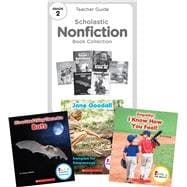 The 20 content-rich nonfiction titles in this collection are a perfect way to promote reading, heighten motivation, and build interest for all of your students. The high-interest texts are leveled to ensure a successful independent reading experience for students of different reading levels. The set includes a teaching guide with reproducible writing activities. For use with Grade 2.